The famous statues of four lions in Trafalgar Square, surrounding Nelson's Column, are commonly known as the ‘Landseer Lions’ after the artist who created them. 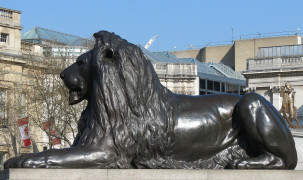 It had not been intended that Landseer would sculpt the lions – the commission had gone first to the sculptor Thomas Milnes, now totally obscure, and he had made a set of four stone lions for the site. 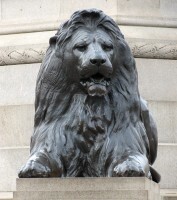 However, these were judged not impressive enough for the memorial to Nelson, and were in the end bought by Titus Salt, and sent to his village of Saltaire, where they remain today. 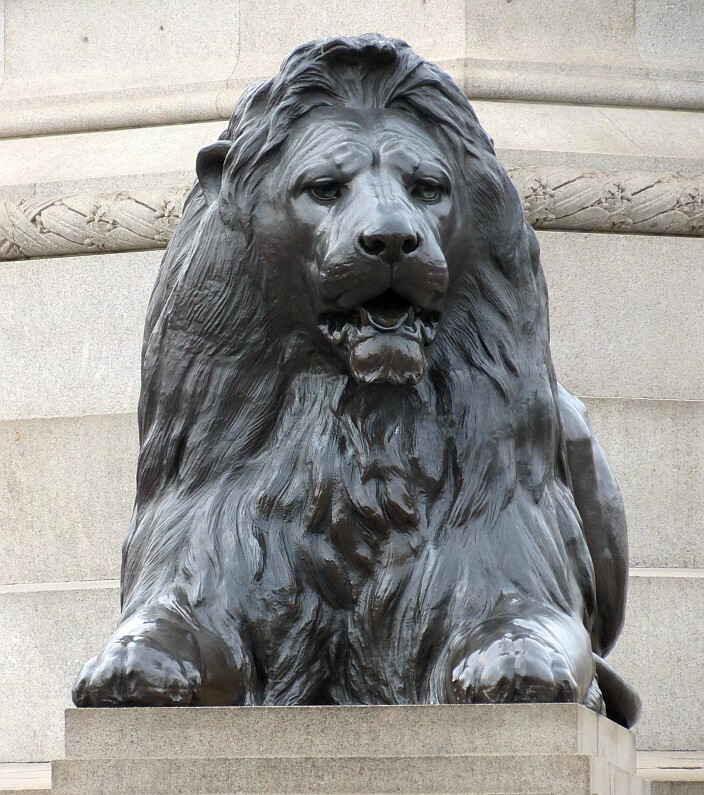 So Edwin Landseer, the famous painter known above all for his dogs, and horses, was asked to design the lions in 1858. 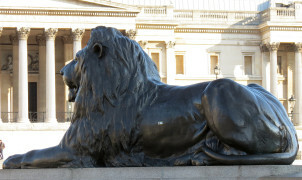 Landseer had in fact already made a series of paintings of lions, but was not a sculptor, but accepted the commission. 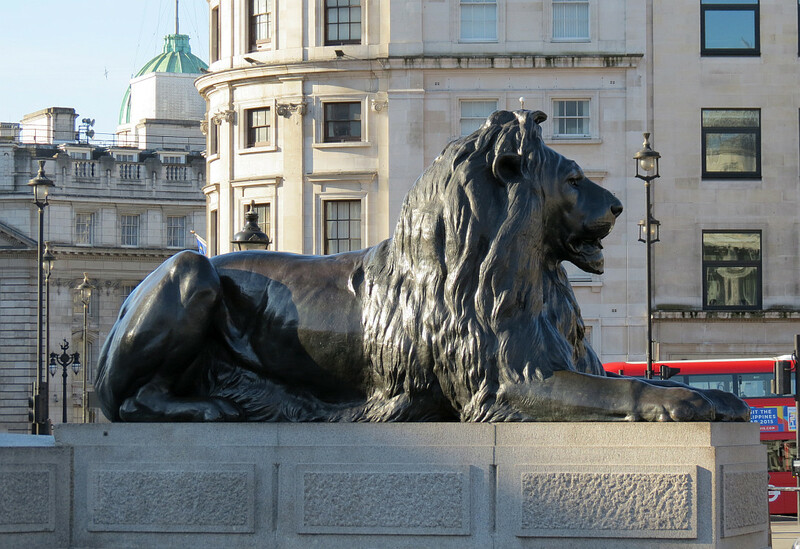 He worked slowly, and four years on, was still sketching them; in the words of the Art Journal, he: ‘was now very accurately studying the habits of lions, and was to be seen in the Zoological Gardens making himself thoroughly acquainted with their attitudes’. 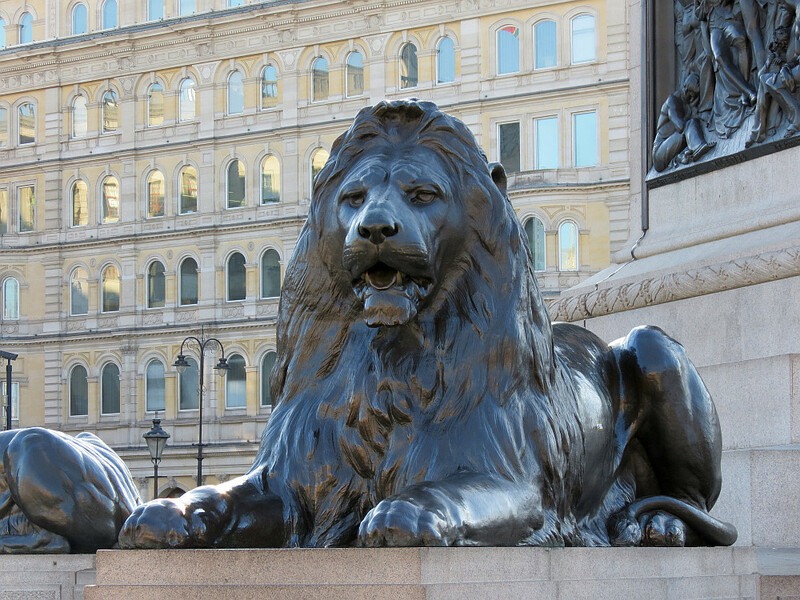 Landseer's lions from different perspectives . 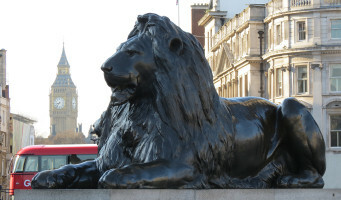 By this time there was criticism of Landseer for the excessive length of time which had gone past, some direct, some ironic: ‘The public was agreeably surprised during the past month to find a huge boarding placed round Trafalgar Square. 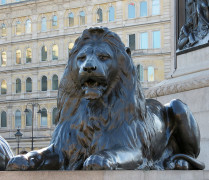 It was received as evidence that Sir Edwin Landseer had awakened from his sleep, and that the lions were about to be in their places. 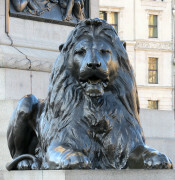 Soon, however, it was ascertained that the paviour [paving stone layer] and not the painter was busied in finishing the very ill-used locality, and the public was doomed to another disappointment.’ In the event, it was only in 1866 that the first of the four lions was completed, and they were finally emplaced in 1867, almost a decade after Landseer had been awarded the commission. 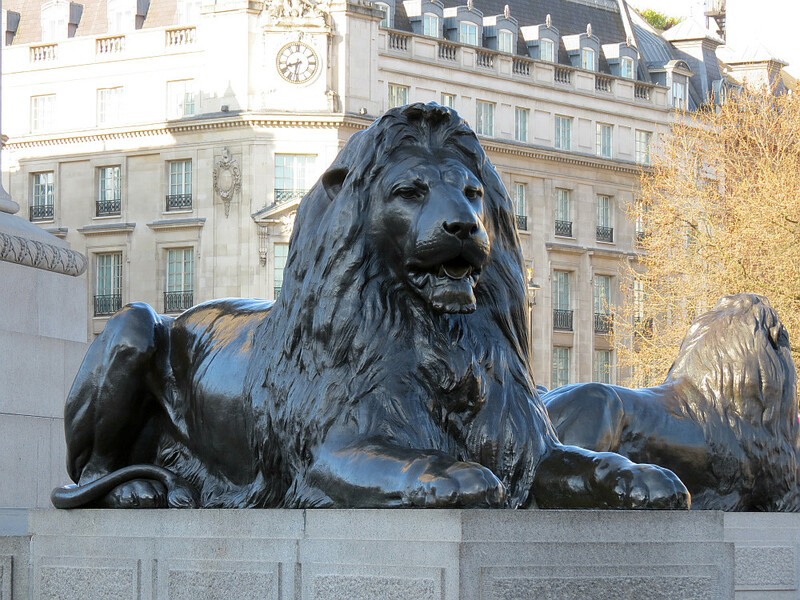 Landseer's lions, beloved of tourists and much climbed over . 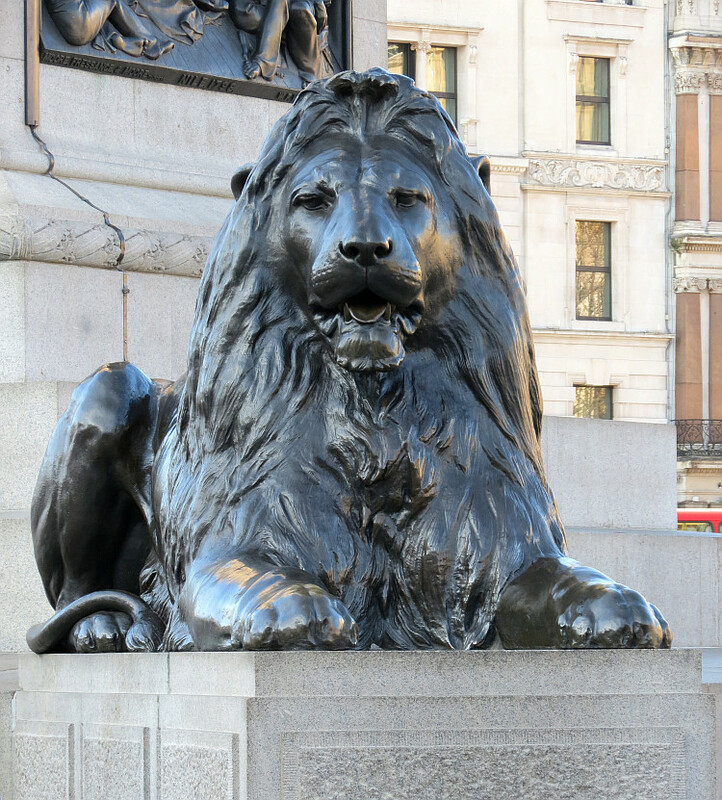 Almost a century and a half later though, the Trafalgar Square lions have become among the most popular of London’s statues (see this page for a list of the others), and as predicted by the Athenaeum in 1863, they are indeed being continually climbed upon, though by tourists and native Londoners rather than merely ‘urchins’. 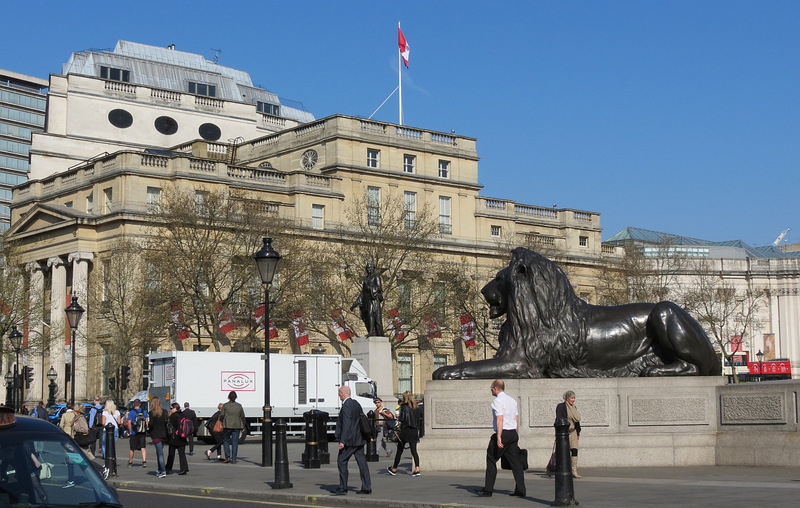 The view above shows the top end of Whitehall as a backdrop. 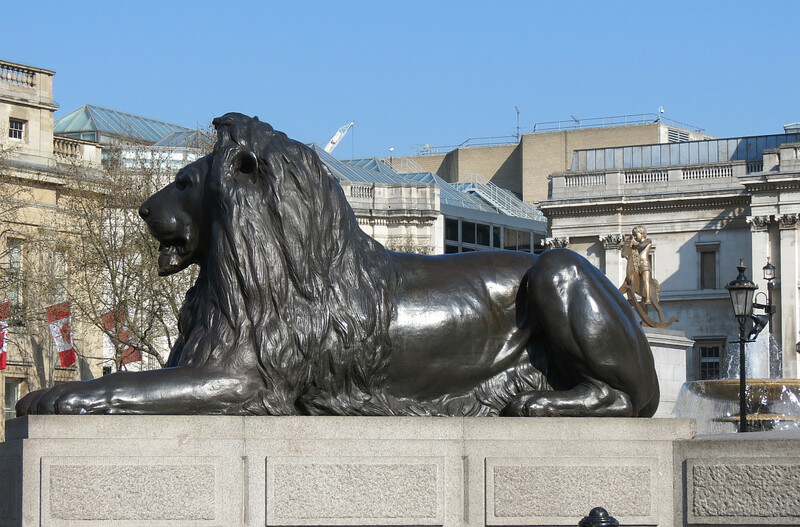 Lion statue with Canada House behind . 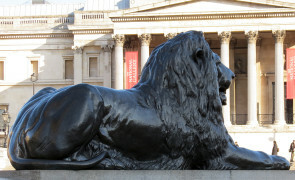 The Trafalgar Square lion statues are not identical, though their sitting positions (‘couchant’ in heraldic terms) with front paws symmetrically forward, and tails curled elegantly around and by their sides, are the same, for they differ in the detail of mane and face. 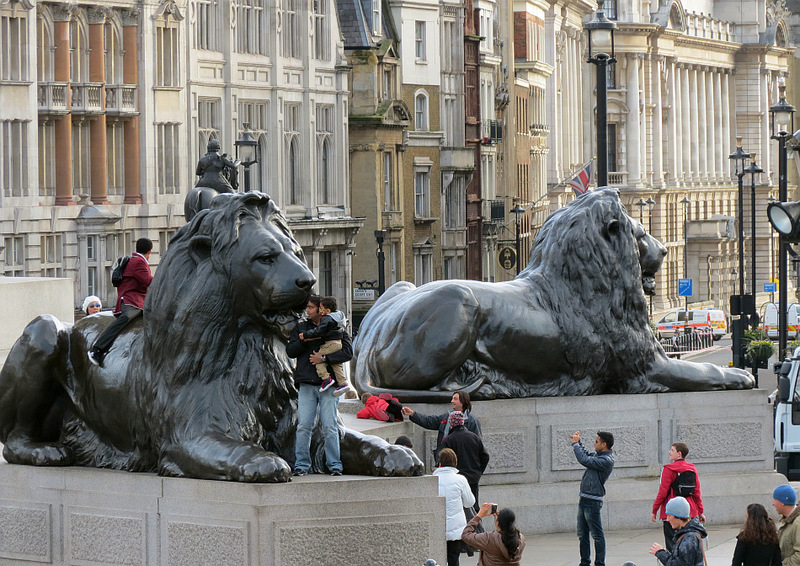 Despite their great size, among the largest of bronze sculptures in the country, they are dwarfed by Nelson’s column, which is thicker at the base than they are long, and despite their raised up position, each on a great plinth, they are easily concealed behind the other sculpture in the Square or by each other, so that from most vantages we see typically just two of them. 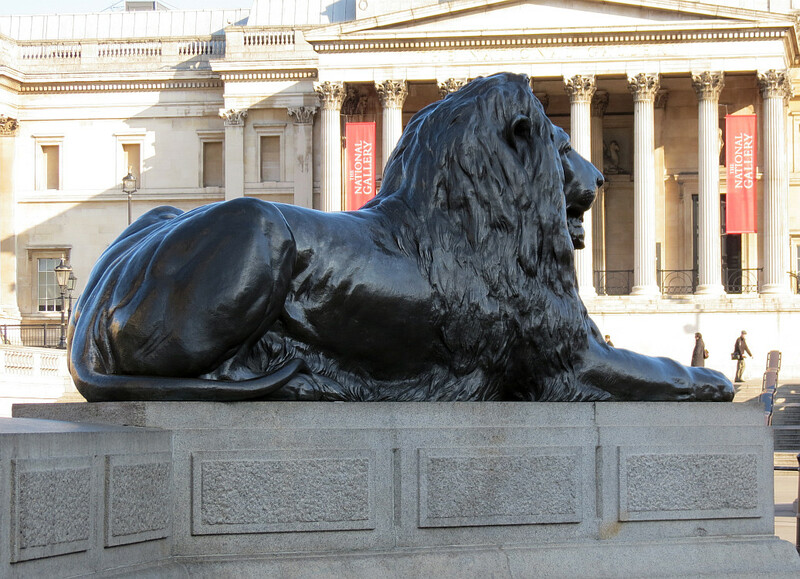 Their positions, pointing outwards at the corners of a square, mean that the lions can be appreciated in front of a variety of splendid backdrops. 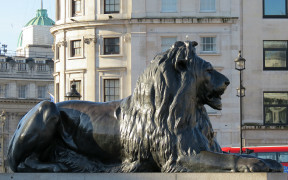 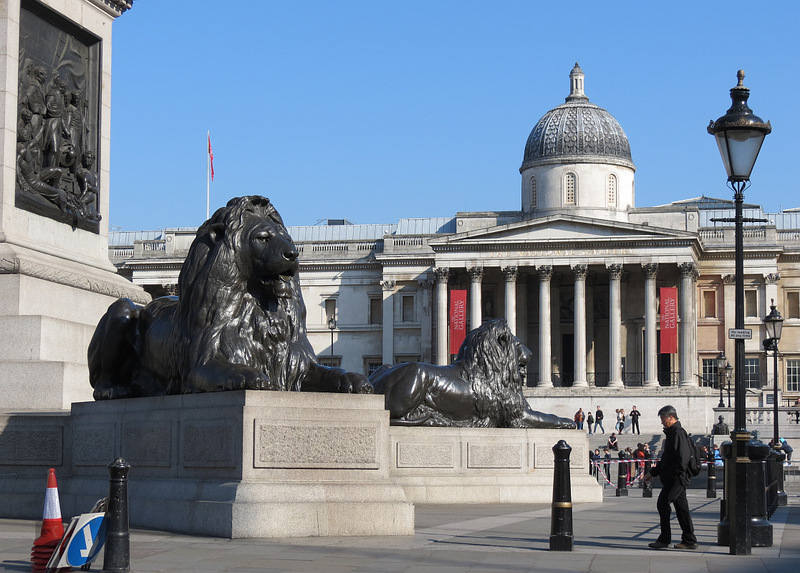 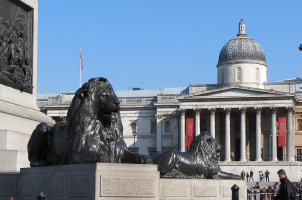 Lion statues are of course extremely common in British sculpture, but apart from one – that by the sculptor George Simonds in Reading – there are none so large as the Trafalgar Square specimens. 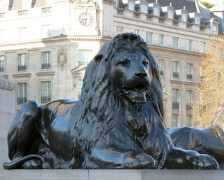 Lots of examples of lion statues are to be found on a separate page on this site. 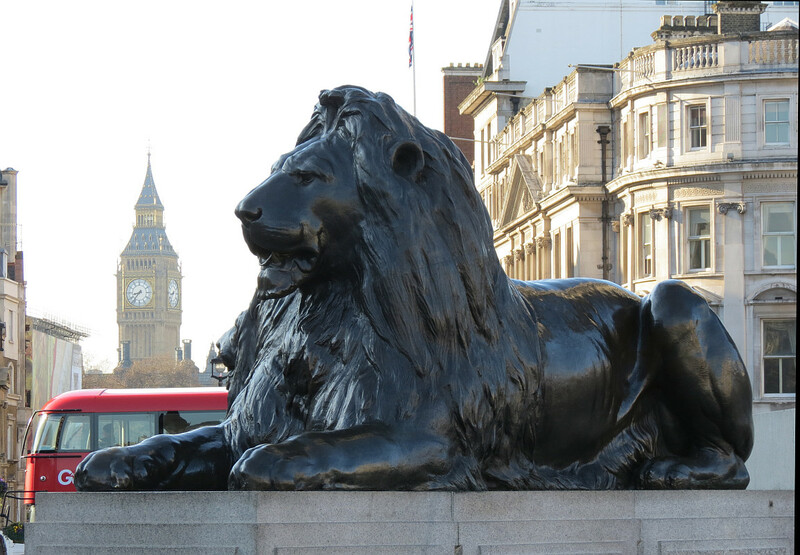 Landseer Lion, Big Ben, London bus - typical iconic view .